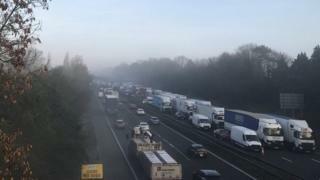 Police investigating a fatal crash on the M6 have criticised people who complained about traffic hold-ups caused by the accident. Daniel Johnson, 30, from Barlaston, died when he was hit by a lorry travelling southbound at about 03:00 GMT on Thursday. The road was closed for nine hours while the scene was investigated. Staffordshire Police said it was "upsetting to hear complaints had been made". "We have a very difficult and meticulous job to do, and I would hope everyone would want a thorough investigation if it was their family member involved," the force's serious collision investigation unit said on Twitter. Mr Johnson had suffered "serious injuries" and died at the scene, on the southbound carriageway between junctions 14 and 13 for Stafford. Earlier in the week, Stoke-on-Trent Live reported "distasteful" comments made by Councillor Ian Lawson, who was late to a Staffordshire County Council meeting because of road closures. He reportedly said: "I would suggest... get the police to get their act together and get these accidents sorted out better than seven hours." Secretary of the Staffordshire Police Federation, Glyn Pattinson, said: "Anyone who criticises the role of the emergency services for dealing with an incident like this is being extremely distasteful."